Are you an avid collector of carnivorous plants? Do you own a retail nursery or would like to buy in bulk for resale? Do you have questions about how to care for your Carnivorous Plant? We grow a wide selection of unique carnivorous plants. "Our mission is to provide quality Carnivorous Plants at reasonable prices as well as expert growing information, fantastic Carnivorous Plant pictures, and reports on Carnivorous Plants in the wild. 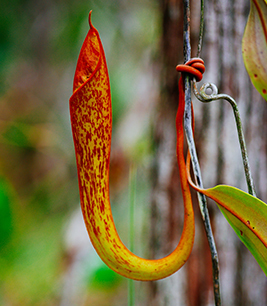 It is our goal to be a valuable resource to Carnivorous Plant enthusiasts the world over! We offer a variety of Carnivorous Plants, with an emphasis on sticky-leaved carnivores. Please enjoy exploring our web site. We hope you find it fun and educational! At Carnivore Culture we take great pride in our plants! After all, we are Carnivorous Plant enthusiasts ourselves! We use a variety of propagation methods including seeds, leaf cuttings, root cuttings, division, and tissue culture. We propagate all our own plants from stock purchased from reputable suppliers. Our plants are grown indoors under intense HO fluorescent lighting in California. We never steal plants from the wild and condemn this practice. All plants are guaranteed to arrive alive and can be shipped anywhere in the USA. We pride ourselves in being the place to buy quality and beautiful Carnivorous Plants for Sale. If you are interested in purchasing a unique carnivorous plant, you came to the right platform.